The International Co-operative Alliance (ICA) – with the scientific and technical support of Euricse – launched at ICA Global Conference in Cape Town the 2013 report of its global statistical project: The World Co-operative Monitor. In this new edition the Report have been enriched with a new feature: a ranking list based on ratio turnover on the gross domestic product (GDP) per capita. The report has been developed this year thanks to the support of the U.S. Overseas Cooperative Development Council (OCDC) and of the Fundacion Espriu from Spain. The project saw the creation of an extensive network of research institutes and agencies with the aim to collect data about co-operatives worldwide and demonstrate the economic and social impact of the largest cooperative and mutual organizations worldwide. The world’s top 300 co-operatives have continued to grow, achieving an overall turnover of $2,097 billion in 2011. The results of the survey confirm an increase from 2010, when the world’s top 300 co-operatives had a turnover of $1,975 billion. In the health and social care sector, the report found 53 cooperatives distributed in 12 countries, with a total turnover in 2011 of $20.84 billion. 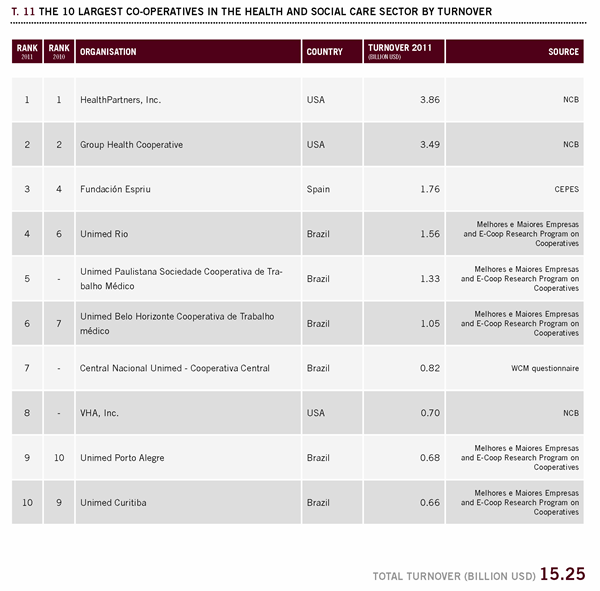 The turnover of 10 largest health cooperatives amounted a total of $15.25 billion. 7 out of these 10 cooperatives are members of IHCO.